Iphone not charging is one of the most common problem associated with the device according to Apple Store employees. While most people may attribute this to faulty batteries, there are many reason your device may not be charging. The device which is one of the best in terms of quality is also one of the most complex when dealing it. In this post, we will be looking at some of the cause and how we can fix this problem. List below are some of the probable cause that may result to your iphone not charging. Although listed above may be some of the reason your iphone won't charge, before jumping into conclusion, it is advisable to carry out some inspection on your device physically to see if you can easily detect the cause. You can start be checking to see if the battery is well placed, if you are using a lower version of the device, or you can check the cords to see if there are not damage. Faulty Battery: One of the many reasons why your iphone may not be charging could be as a result to faulty battery. It may arise as a result of either over charging or leaving the iphone without charging it for a very long time. While this may be the reason, Faulty battery is one of the easiest problem to over come. It can be achieve by simply replacing or getting a new battery for the device. Before buying a new battery, you could try to see if you can boost some life into the battery. If you not know how, you should take it to a technician who can do this for. It is much cheaper compere to getting a new one. Charging Ports: This is another good reason why your device may not be charging. In most cases, this fault may arise as a result of damage or dirt in the charging port. If your case is dirt blocking the port, simply get a touch or any comfortable source of light, a toothbrush and gently brush out the dirt. If you should try this and the phone is still not charging, then it maybe as a result of the port been damage. If this is the case, then you need to service of a technician to help you fix this problem. Contact With Fluid: Your iphone not charging could be as a result of it getting in contact with water or any fluid. If your phone was accidentally submerged in water, it may causes a short circuit in the charging port which may cause the phone not to charge. You can easily solve this problem by dry your phone about 72 hours or so. You can also dry your phone in silica or rice for a better result. If this doesn't work for you, then seek the service of a technician. Power Source: Another reason your iphone may not be charging could by power source problem. 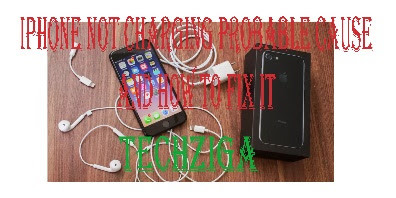 If they is a fluctuation in the power source, your Iphone software detects this and then prevent the device from damage be making it not to charge. Also like a said above, it could also be as a result of faulty charging cords. To fix this, plug your device into another or stable source of power supply or check to see if your cable/cord is working perfectly. Software Problem: Software problem can also be the reason why your iphone device may not be working. In this case, you must have verify that all the physical problem listed above are not the cause of the problem. This problem is more technical and in must cases requires the service of a specialist. This may have been cause by your device crashing resulting in your iPhone screen looking completely blank. If this is the case, then you need to perform a hard reset by holding the power button and the home button down for about 30 seconds and the device will reboot. These are some of the causes or reasons why you may be experiencing not charging problems with your iphone device. If you have check the reason above and tried all the method above to fix it and non worked, then you can visit the nearest iphone service center or any trusted technician to work on your device. If you think this post was helpful, then share with your friends.